The UK has abstained from a key UN resolution accusing Israel of “possible war crimes and crimes against humanity” after Foreign Secretary Jeremy Hunt suggested it would vote against all anti-Israel motions. 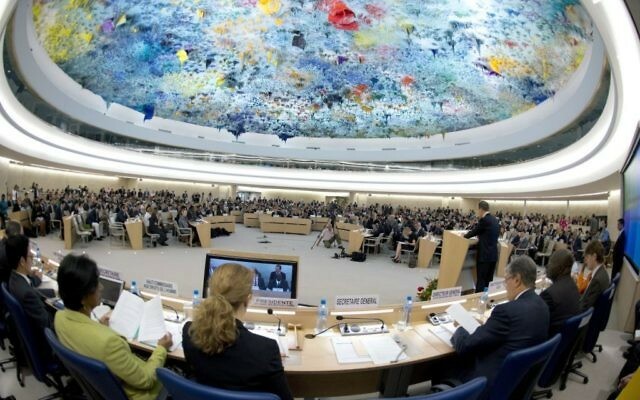 During a stormy UNHRC session in Geneva on Thursday evening, the UK said it would vote against four ‘Item 7’ resolutions, listed under an ongoing Israel agenda item, which the UK considers unfair and “discriminatory”. However it abstained from Resolution L25 because it was considered under a different agenda item concerning the High Commissioner’s Report, which the UK said “applies to all and does not discriminate between situations”. L25 singles Israel out for “ensuring accountability and justice for all violations of international law in the Occupied Palestinian Territory, including East Jerusalem”. It accuses Israel of “violations of human rights and international humanitarian law and of “widespread and unprecedented levels of destruction, death and human suffering caused in the Occupied Palestinian Territory, including East Jerusalem”. L25 further “emphasises the need for States to investigate and prosecute grave breaches of the Geneva Conventions of 1949 and other serious violations of international humanitarian law, to end impunity,” noting that the State of Palestine acceded to the Rome Statute of the International Criminal Court in 2015. It also “condemns the apparent intentional use of unlawful lethal and other excessive force by Israel, the occupying Power, against civilians, including against civilians with special protected status under international law, notably children, journalists, health workers and persons with disabilities, who pose no imminent threat to life”. Jewish communal organisations thanked the UK Government for voting against anti-Israel resolutions but said it should have voted against L25 as well. “We are pleased that the Government has honoured its pledge to vote against all four UNHRC motions against Israel under Item 7,” said Jewish Leadership Council chief executive Simon Johnson in a statement published on Twitter. Resolution L25, which was put forward by Pakistan on behalf of the Organisation of Islamic Countries (OIC), was adopted after 23 countries voted for it, eight voted against and 15 abstained. The United States did not vote because Donald Trump withdrew from the Council last year, citing its anti-Israel bias. In 2017 the UK told the Council that Item 7 “amounted to systemic institutional bias, and unless things change we would move to voting against all Item 7 resolutions”. Last year, it fulfilled its pledge and voted against an accountability resolution. On Thursday, the UK’s envoy to the UN Julian Braithwaite said the UK would do likewise this year, voting against another four resolutions, but “welcomed” the fact that L25 was brought under Item 2. Braithwaite added that “accountability must be pursued impartially, fairly, and in a balanced manner” but that the UK could not vote ‘for’ the resolution because it does not explicitly call for accountability from all non-state actors “such as Hamas”.